This Slow Cooked Fiesta Chicken And Rice is as delicious as the colors are vibrant. It’s truly a feast for the senses. Boneless skinless chicken breasts are rubbed with a blend of spices then nestled into a creamy rice mixture and slow cooked until the rice and chicken are tender. 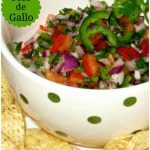 Topped with plenty of gooey cheese and chopped chives or green onion for even more color then serve with your favorite taco toppings for a homemade fiesta any night of the week. If your family is like mine, we have to have at least one Mexican or Southwestern inspired dish every week. Truth be told, we often enjoy these flavors in some form more often. Dishes like tacos, enchiladas, pico de gallo, taco salads and queso dips are fun food to make and eat. Then there’s guacamole which we love so much we vote it should have it’s own food group. This festive chicken and rice dish is one you might not think there’s time to prepare on a busy day but, it‘s designed for just that. Everything goes into the slow cooker and the rest is history. Top it with sour cream, olives, pico de gallo, salad or guacamole and it becomes a one pot meal. You may also like: 10 Dishes To Rock Your Cinco de Mayo Celebration, Mexican Rice and Slow Cooker Street Tacos. Spray the inside of a 6 quart slow cooker with cooking spray. In a small bowl, mix together, lime juice, olive oil, 1 tsp cumin, 1 tsp chili powder and garlic salt to form a paste. Rub on all sides of chicken, set aside. On the stove top, saute the diced peppers and onions in a couple of drizzles of olive oil until beginning to brown. Season with salt and black pepper to your taste. Add butter and minced garlic. Simmer for 1 minute. To the pan add the chicken stock, scraping any brown bits from pan. Stir in remaining cumin, chili powder plus 1 tsp oregano. Stir well. Add rice, soup, salsa, cilantro, black beans, corn and chopped cilantro. Mix thoroughly then pour into slow cooker. Arrange chicken breasts on top..
Cook on low for 4 1/2-5 hours. In the last 5 minutes of cooking, remove the lid and sprinkle shredded cheese on top then replace the lid. Keep warm just until cheese has melted. Serve with a dollop of sour cream or guacamole on the side and garnish with chopped chives or green onions before serving. It's a good idea to stir this at least once midway through cooking, if possible. I usually remove the chicken breasts, give the rice a good stir, and then replace the chicken. This will prevent the rice from getting too brown around the edges. This looks heavenly. Just to confirm… you don’t keep cooking the veggie, stock, rice mixture until the rice is cooked correct? It goes in raw? I have this in the crock pot right now! Thank you for sharing. Trying this over the weekend! “Red pepper” – do you mean red bell pepper? Just wanted to double-check. Yes, red bell pepper. I added that to the recipe to clarify. Enjoy! I will. Can’t wait to make this! This looks so good! I have high blood pressure, so I try not to use any packaged rice mixes due to the sodium. Would plain rice be okay? If so, how much should be used? Thanks! Hi Amanda, I have always prepared this recipe as written, however, I think you could sub the rice. Use a long grain rice and use approximately 1 1/2 cup uncooked rice. You can add turmeric or ground saffron if you have either to achieve the rich yellow color, if desired. Then adjust the salt to your liking. Hope this helps. No need to precook the rice. Just put this in the crockpot and it smells delicious already! Will let you know how it comes out. Wonderful, we love this one sure hope you do too! Made this tonight!!! OMG it was to die for!! I think I will shred the chicken and mix it in for burritos tomorrow night. So happy you loved this one and what a great idea! Thank you. Sure, just make sure they’re rinsed well. I used Vigo Saffron rice. I cooked it on high for an hour. Then on low for 3 hours. The rice was still not cooked. So I added 2 cups of water and cooked it an additional 3 hours on low and my rice is still not cooked. I’ve never good saffron rice it suppose to have a crunch to it? I can’t understand why it’s not soft by now. Thanks! Hi Trisha, the rice should have had ample time to cook in that time. However, if you’re using an older crock pot they don’t get as hot as the newer models and that could effect how the rice performs cooking time. I love cauliflower rice, too. I’ve never made this slow cooker chicken with it, though. If you try it let me know how it works. Can you put the chicken in frozen or does it have to be defrosted? I’ve done it both ways and frozen or partially frozen is fine. Wow! This was awesome! Only had to make a few changes. Substituted kidney beans for black beans (black beans really mess with my stomach). The only rice i had on hand was Goya Spanish rice and it worked out nicely in this recipe. I did end up adding another half cup of chicken broth. Used fresh pablano peppers from my garden and added a dash of chipotle hot sauce. Thanks for this recipe! Will definitely make this again! Wonderful, so happy you loved this one! Is this really spicy or just good flavor? Would love to make for dinner tonight! You can adjust the heat to your taste by using a mild salsa. Since spice is totally subjective I would say adjust any of the seasonings to your personal taste and it should work well for you.